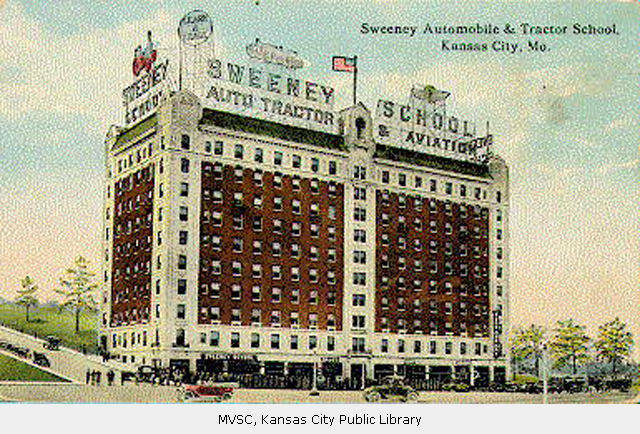 Sweeney Automobile School Post Card, Courtesy MVSC. As part of our internship, Natalie and I are researching historic buildings in Kansas City and writing brief architectural and historical summaries for each property. Finding information about historic structures has been challenging, especially for structures that have been repurposed several times. Churches proved to be particularly difficult to track down if the original congregations moved elsewhere. My hunt for these ephemeral histories led me to the Missouri Valley Special Collections. The collections are accessible primary two ways: one, online via the digital galleries, and two, by visiting the Missouri Valley Room. There are some distinct advantages to the online sources. They are accessible from anywhere with an internet connection, and they available 24 hours a day. Even better, if the material is old enough to be in the public domain, then you can usually make digital copies for free. Nothing like downloading a series of books and carrying a library on your thumb drive! But really, there’s something to be said about sitting down at a desk and leafing through tangible documents. That, and despite the wonders of Google, there’s an unbelievable amount of information that has not been digitized. So, if you really want to get into the historical nitty-gritty, you have to go to the sources. And if you are researching a Kansas City or regional history topic, you should do yourself a favor and check out the Missouri Valley Special Collections. The collection’s catalogue is available online, and they have shocking breadth and depth – check it out for yourself! Located on the fifth floor of the Kansas City Public Library’s Central Branch, The Missouri Valley Room is a free, open to the public research and reading space. You do have to sign up for a researcher card and store any bags or backpacks in lockers, but the process is easy and the staff are helpful and welcoming. Some books and manuscript sources are readily available for perusal, but you will need to request the bulk of the materials at the desk. They’ll buzz back for the item and it will be brought out to you. I found the collection’s extensive vertical files most helpful for our internship. For those that haven’t used them, vertical files are collections of articles, pamphlets, and other documents pertaining to specific topics. The library curates the files, saving items of note to the collection. I had the hardest time finding information about the Sweeney Auto School Building, but the vertical file had all sorts of informative goodies. The contents can be a bit haphazard, but like gambling, the uncertainty is part of the adventure. One of the great things about historical research is that it takes all sorts of wonderful places. Well, if you’re reading this blog, I assume that your definition of wonderful places at least somewhat overlaps with mine. Libraries, archives, and other knowledge repositories certainly occupy a spot near the top of my list, making the MIssouri Valley Room is a new favorite haunt for making history in Kansas City. This entry was posted in HistoryMaking and tagged Historic Buildings, Kansas City, MO Historic Preservation Office on May 12, 2014 by Matthew Reeves.